I find myself agreeing with this more and more. Sometimes comments on the new social order will just say: Take the red pill. It means to see the big picture in a way that no one will explain, and that you would not believe if someone did explain it. 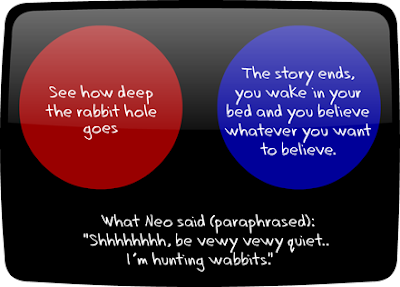 You take the red pill to see for yourself how deep the rabbit hole goes. Red does not refer to Republican, altho Pres. Barack Obama did once urge people to take the blue pill instead. Here is explanation of the metaphor. The Blue Pill is the lie. The Blue Pill is the avalanche of marriage and dating advice that’s out there. There’s been books, movies, magazines, TV shows, seminars and sermons telling you how relationships should be. There’s what your parents brought you up to believe, what your friends told you and what she said she wanted to be happy. There’s been over fifty years of professional help from doctors, psychologists, counselors, teachers, ministers and more……and the divorce rate has never been higher. The advice is that bad. The Blue Pill is what women say they want from a man. I do believe that 95% of the professional relationship advice is bad advice. I essentially agree that a significant portion of the professional help out there is not going to salvage (or save?) a bad marriage. I have always viewed such services with natural skepticism simply because two mature, rational adults should be able to come to some type of accommodation on their own. I mean honestly - if a well-meaning councilor is the only thing that can save a marriage or any other relationship - how much does it say about either person if they are putting their own future into the hands of a stranger? Look at it another way: Assigning additional blame for rising divorce rates on the backs of the relationship guidance industry is like blaming the rise in obesity in America on the exercise industry. The two are alike in that their expansion into the marketplace has come about because two problems - failing marriages and obesity rates - are both on the rise. They are also both alike in that despite more and more Americans seeing counselors and participating at gyms on a regular basis - neither service has managed to abate the actual problem at hand. The problem with gyms is that the cause of the weight problems is the food people are taking in and the quantity. Failing to address this first has allowed waistlines to bulge no matter how hard the person works out. Marriages are failing because gender rolls have been turned upside down. Marriage lasted for thousands of years across widespread cultures because they were centered around the mutual roles of the authoritative, decision-making, bread-winning, protective presence of a father coupled alongside the nurturing, protective, supportive and gentle guidance of a mother. Men today do not see it as their primary duty to take a leading role or often see nothing wrong with being near-do-wells with regards to being a provider. Feminism has saw to it that an overwhelmingly liberal school system - where teachers are far more often to be women - have caused what used to be a statistically higher likelihood of boys participating and being called upon in class to one where it is girls - not boys - who are likely to graduate and seek a career, as well as seek higher degrees and PHDs. Marriages are failing because the foundation and purpose of marriage - which used to be raising families - has been replaced with a romantic notion of marriage that simply does not exist. You ultimately end up having women settling for men who are not marriage material and men who are selling themselves and the roles they have to play short in an attempt to appeal to women based on standards that are not rooted in reality.